It’s the Sunday morning after Feria and all of Sevilla is sleeping in. After a week full of sevillana dancing and rebujito drinking, today is the day of rest. 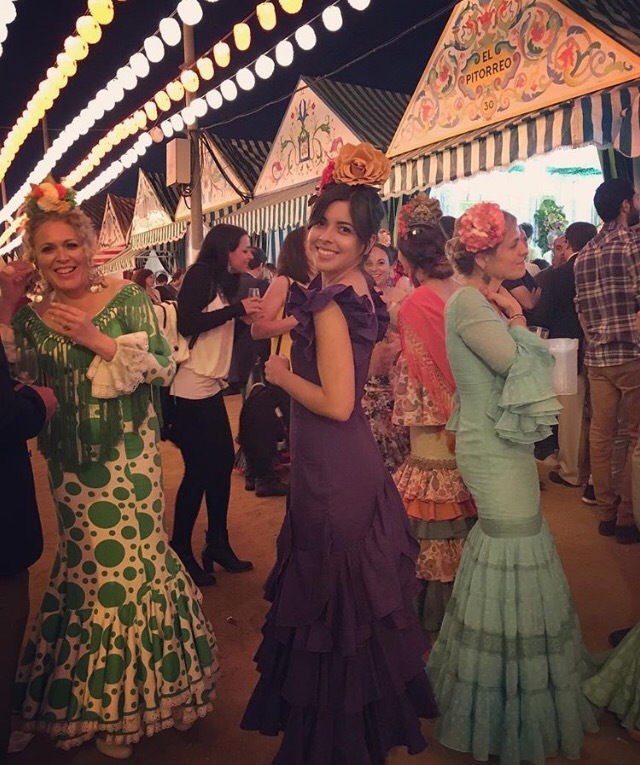 Feria is a week-long celebration following Semana Santa. It begins about two weeks after the Easter holiday and lasts until the following Sunday. 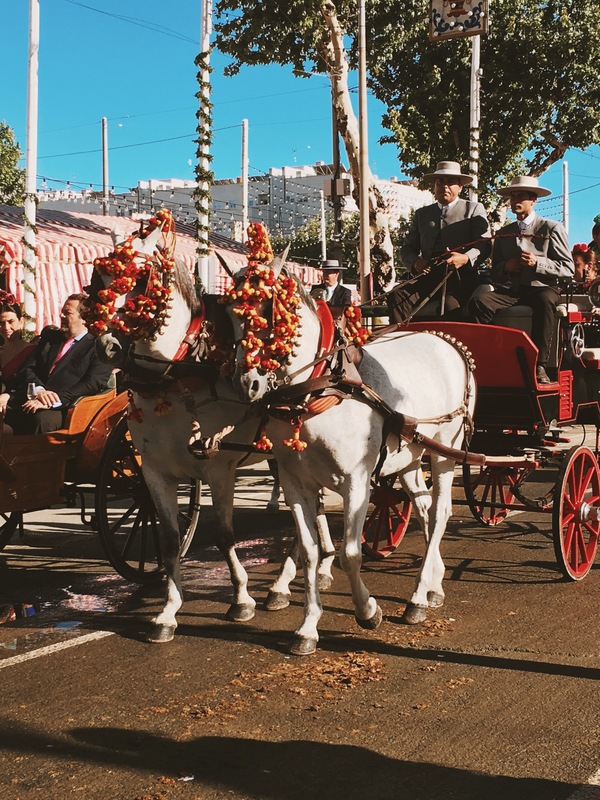 Throughout the week you’ll encounter horse-drawn carriages and crowds dressed in timeless attire. Men wear a typical traje corto or cut jacket with dress pants. Everyone dresses in their Sunday best but it’s the women who steal the show in their colorful traje de gitana. Couple Dressed in Traditional Feria Attire. 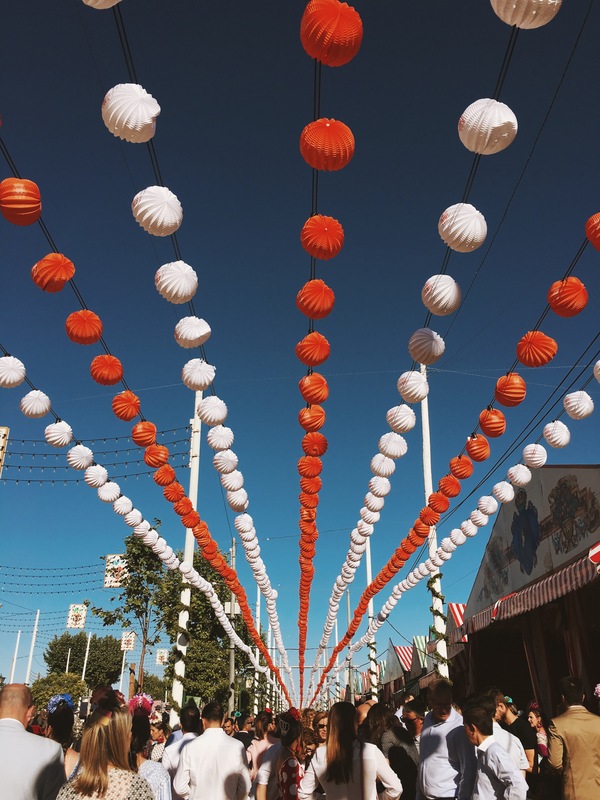 Festival Lights Illuminating the Streets. 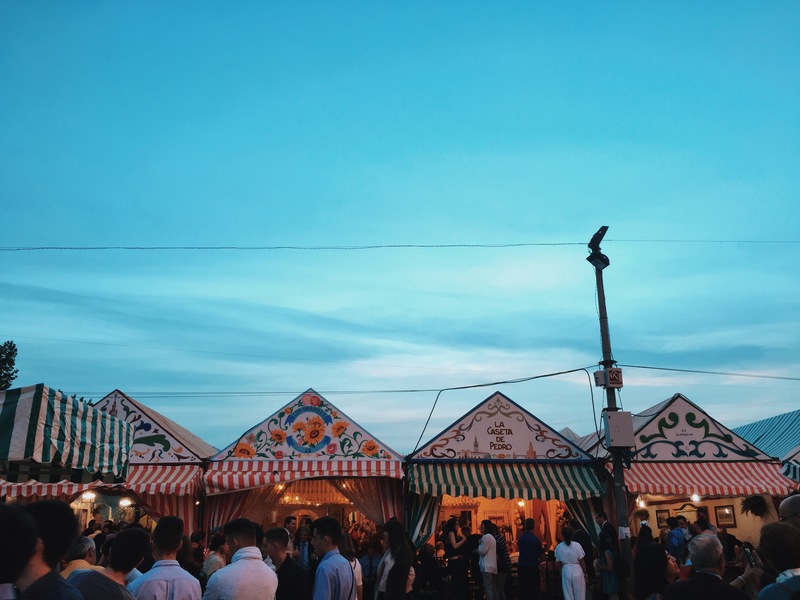 Although Feria is located in a large fairground, the real Feria takes place inside the casetas, or small marquees, that line the avenue. The casetas are full of people drinking rebujitos (a mix of sherry and 7-up) and dancing sevillanas. 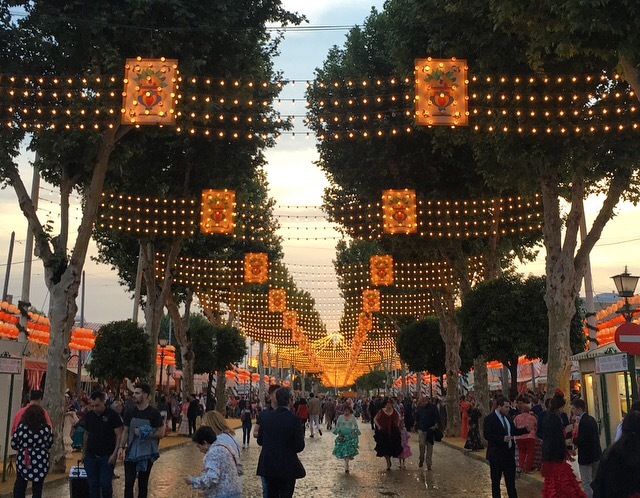 Most casetas are private and you must have an invite to enter but there are a few public casetas where everyone can get the full Feria experience. Be prepared to stay up late ! Most casetas keep going until 6 or 7 in the morning. 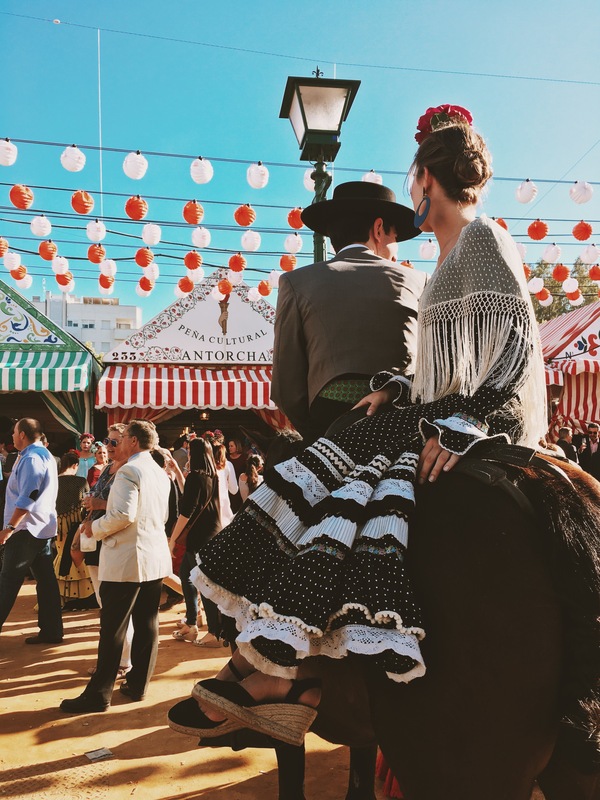 If you are a visitor and just coming for a day or two, you can wear the traditional feria attire or get away with dressing smart casual. This year a friend of mine lent me a traje de gitana. It was a beautiful royal purple with ruffled sleeves at the shoulders. 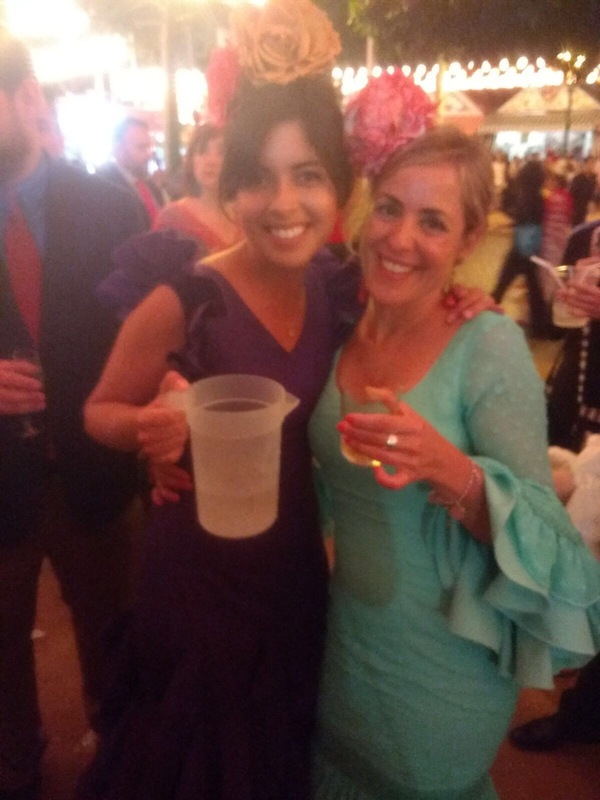 I also wore a typical floral headpiece and black heeled boots. My friend from work and I enjoying some Rebujito! Love it !! This is so interesting and educational. Now I feel like I have to go experience it ! Oh how this post has made me look forward to my move to Sevilla! I’m doing the Auxiliares program as well! I cannot wait!